Save by purchasing the entire CD! Click HERE for song lyrics. It is rare to find a collaboration as complete and equitable as Stowe Good. Elton John and Bernie Taupin were lyricists and composer. Simon and Garfunkel were songwriter and singer. Hall and Oates, Loggins and Messina, Brooks and Dunn. In each case one stood out as THE singer, THE songwriter, THE star. But here is a game of catch between two equally invested artists, tossing songs, lead vocals, and jokes back and forth, refusing to allow the listener to settle on a favorite. 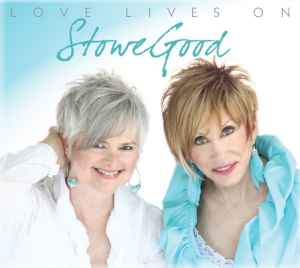 Karen and Stowe’s voices are just enough alike that they blend effortlessly and just different enough to allow their individual styles to shine on their lead vocals. Stowe has a natural sensibility for country and Karen – more of a pop flavor. Together they explore and excavate a middle ground that, intentionally or not, reveals precious artifacts, musically and topically to listeners across a broad spectrum of tastes. There is a third member of this duet, producer/guitarist Brendan Harkin who seems to know instinctively when to pull out the slide guitars and when to rock it musically with these songs. His pop and country sensibility keeps the CD interesting from beginning to end. Much of the most endearing moments of the CD is the banter between the two artists inserted throughout that will give you a taste of what it will be like to see these guys up close and personal. Co-writes with Karen Drucker and Jan Garrett add dimension to the already thick and juicy songs. Born Winner – opening song sets the tone for the CD both musically and topically. It’s all about empowerment. Love Lives On is a tender dedication to the Sandy Hook children and those affected by the tragedy and meant to bring comfort to the grieving parents and community. Lean Into It is about the rewards of embracing the darker emotions of pain, fear and loneliness that we would normally tend to avoid. Just Say Yes – Shades of “Shout” by the Isley Brothers except with a positive message and much sweeter and gentler voices. From Here to There – the “here” is experiencing grief in your life. The “there” is coming out the other side. Sometimes it feels like it will never happen but this song reassures you that all things pass in time. Tears – originally written about the writing process the two of them employ, but of course, the underlying message is universal. What can we learn from our tears? You Are Loved – Contains the “middle aged white woman rap.” Enough said. Step Away from the Seed – four way co-write with Karen Drucker and Jan Garrett. At least a hundred years of songwriting experience, thousands of songs, and decades of performance experience all come together on this tongue in cheek half sung, half narrated treatise on faith. Sweet Sweet You – a gift to the listeners, fans and sponsors of this duo – “if you got the ears, we got the song.” Let those who have ears listen! For the most part, this collection is geared toward women and women’s issues though many of the songs have a “neutral” or universal message that men can glean wisdom from as well. For men I would say, “The perfect gift for that special lady in your life.” Then encourage them to listen closely to what is important to the opposite gender and learn a lot about yourself in the process.